The lucky hunter, Jim is apparently a friend of the shop and arrowed the giant white-tail on September 18. The buck was apparently rough scored by non-official scorers that came up with a rough score of 244 inches. The deer is rumored to have been killed in Waukesha County, which has a mix of farmland and suburban areas. The Southern portion of the state has had some great bucks taken, including this potential Wisconsin state record non-typical buck. The owner of Whale Tales Archery, Kyle Krischan said that the hunter is a friend of the shop and has been hunting this deer for several years. Krischan said that the guys who scored the deer are very reputable and that the deer was known to several people, but those who knew it did a good job of keeping it quiet. 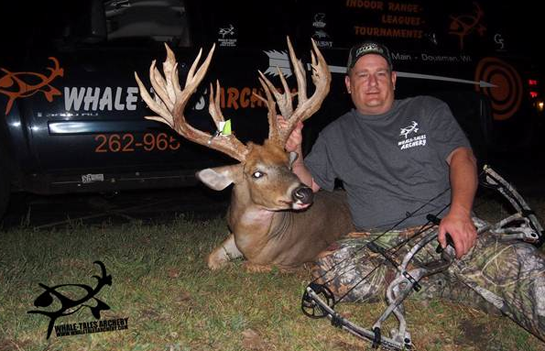 Giant Wisconsin White-Tailed Deer typically fall in the early season or the rut in the highly pressured archery state. Smart hunting and good scouting can end your season quickly and for this lucky hunter, it may just end up being the start of a new record-book buck.